It’s September, but I refuse to believe it’s the end of ice cream season. No way! You can talk to me about fall weather and fuzzy scarves and pumpkin lattes all you want, but I’m not convinced. I’m keeping my ice cream. And I’ll pick up a few candy bars while I’m at it, because you know what? We have milkshakes to make! 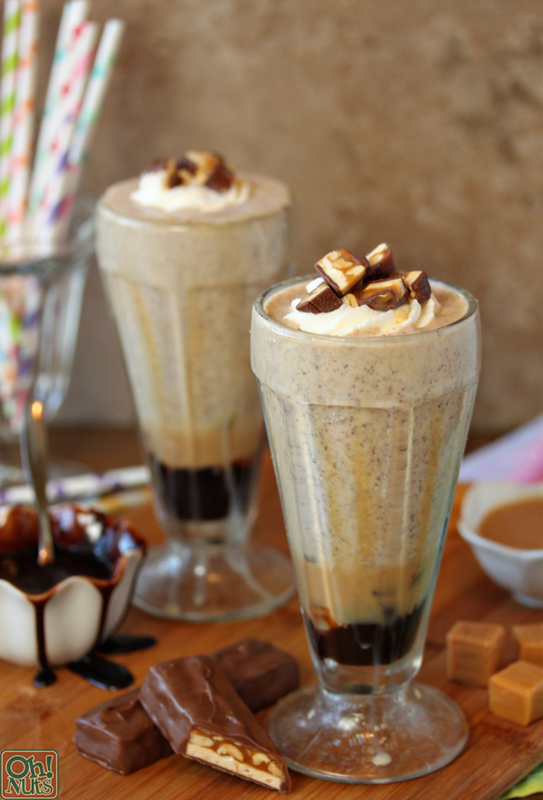 These Candy Bar Milkshakes are epic. They’re for all you chocoholics out there. And caramelholics. And ice creamaholics. And if you happen to be a combination of all three of those things, you are going to be one very happy camper. 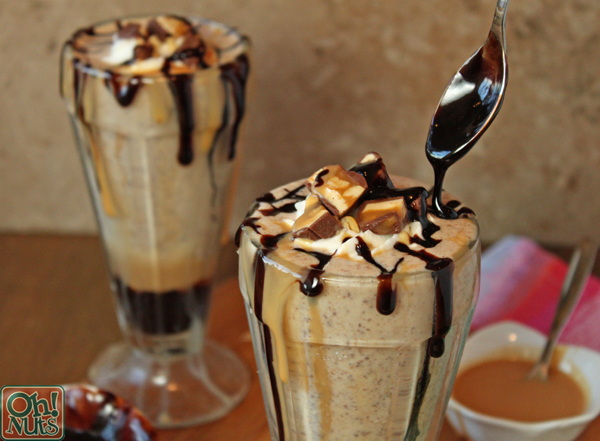 The milkshakes are packed with fudge sauce, a quick caramel sauce made from real caramels, chocolate-covered peanuts, chopped candy bars, and your favorite ice cream flavor. Sounds intense? It is. Sounds delicious? Yep, it’s that too. Let’s do this thing! 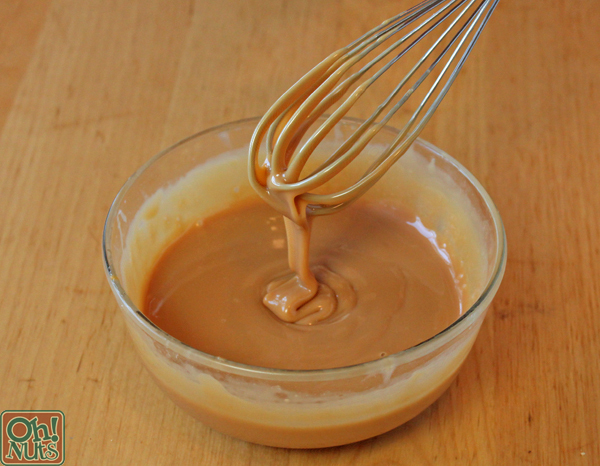 Since milkshakes don’t require too much by way of explanation or step-by-step photos, I thought I’d include a bonus recipe: a quick and easy way to make caramel sauce from prepackaged caramels! 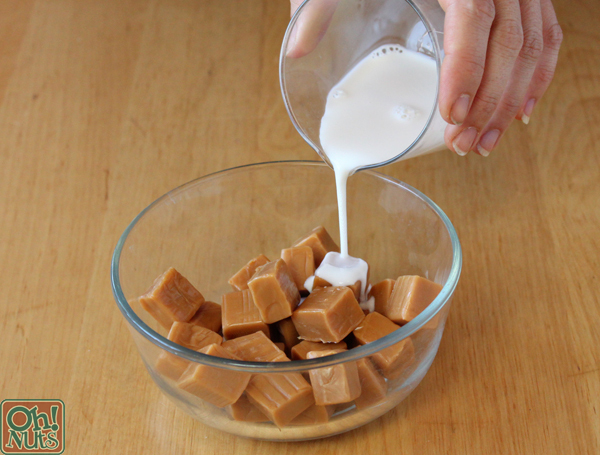 This will work with practically any soft caramel you have. Unwrap them, and place them in a microwave-safe bowl. Add 2 tablespoons of milk to the bowl. Cream, half and half, or water can all be substituted for milk. 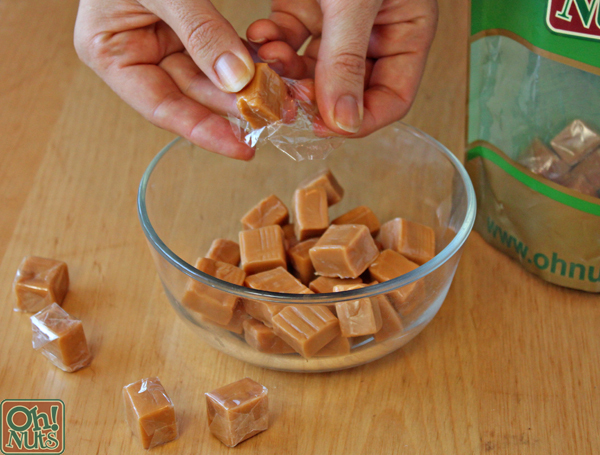 Microwave the caramels in 30-second increments until they are melted. Stir after every 30 seconds, first with a spatula and then with a whisk. At first the caramels will seem stiff and will resist melting, but after about 3 minutes, the caramels will turn into a melted, smooth caramel sauce. If it’s too thick to drizzle easily, add a bit more milk until it thins out. 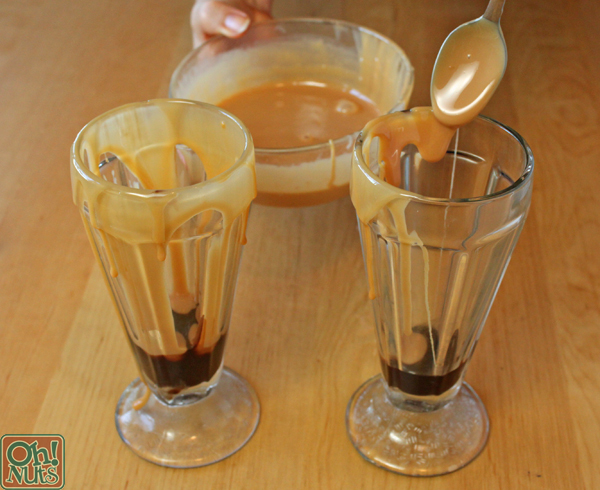 Set your new spiffy homemade caramel sauce aside to cool slightly while you prepare the milkshake. 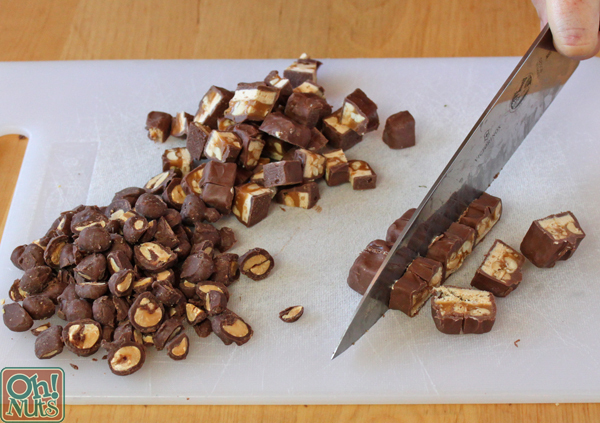 Coarsely chop the chocolate-covered peanuts and the candy bars, and set them aside for now. Combine the slightly softened ice cream and the remaining 1 cup of milk in the blender, then add most of the chopped candy bars and nuts. Reserve a handful of candy, to use as a garnish later. Blend in 5-second bursts, scraping the bottom and sides of the mixer occasionally to help everything mix evenly. 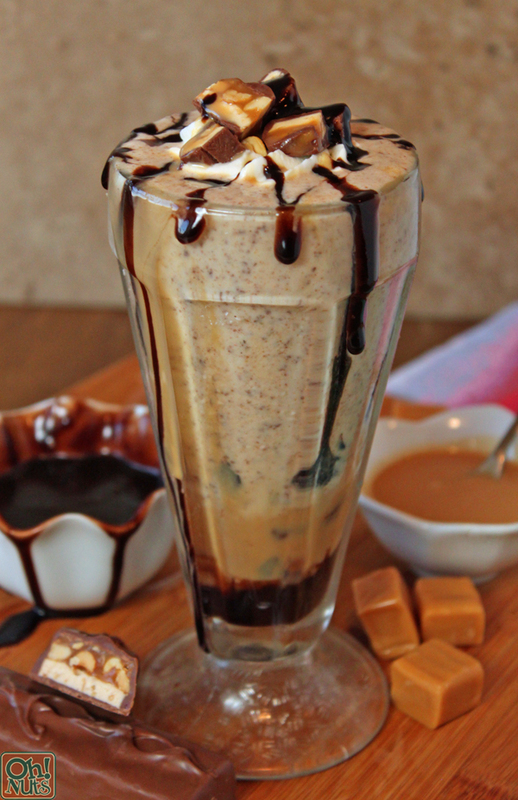 The milkshake is done when it has a thick, smooth texture and small bits of candy bars and peanuts scattered throughout. 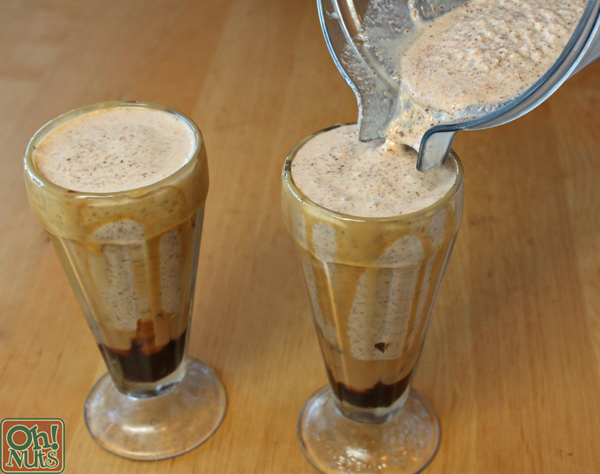 The texture should be similar to a cookies and cream milkshake–not super chunky, but not perfectly smooth. 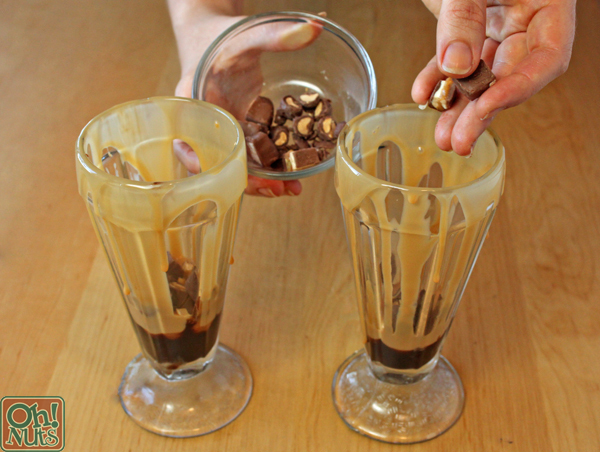 Now for the fun part: preparing the over-the-top milkshake cups! 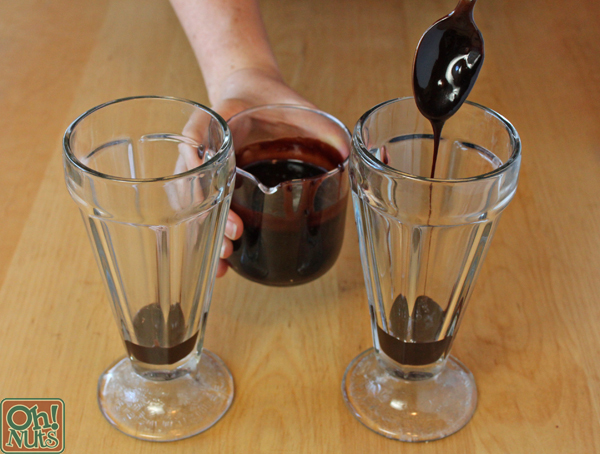 Drizzle a little hot fudge sauce into the bottom of each cup. Add a layer of caramel sauce on top of the fudge sauce. I wanted to emphasize the caramel part of this recipe, so I dripped it down the inside of the glass too. Now, just a pinch of chopped candy! This whole “surprise on the bottom” set up makes these milkshakes super fun to eat with a long spoon–each bite has a layer of something new and unexpected! Pour the milkshakes into the prepared cups. And if you want to add one more drizzle of chocolate and caramel sauce, I certainly won’t stop you! Enjoy immediately. Unwrap the caramels, and place them in a microwave-safe bowl with 2 tbsp milk. Microwave the caramels in 30-second increments until they are melted. Stir after every 30 seconds. At first they will seem stiff, but after about 3 minutes, the caramels will turn into a melted, smooth caramel sauce. If it’s too thick to drizzle easily, add a bit more milk until it thins out. Set aside to cool slightly while you prepare the milkshake. Coarsely chop the chocolate-covered nuts and candy bars, and set aside. 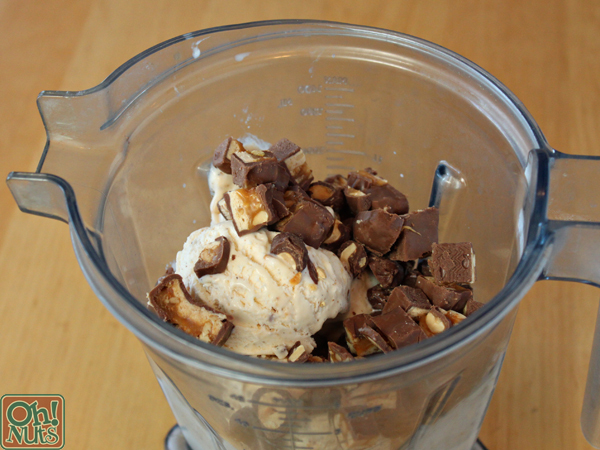 Combine the ice cream, remaining 1 cup of milk, and most of the chopped peanuts and candy bars in the blender. Reserve a handful of chopped candy for garnishing. 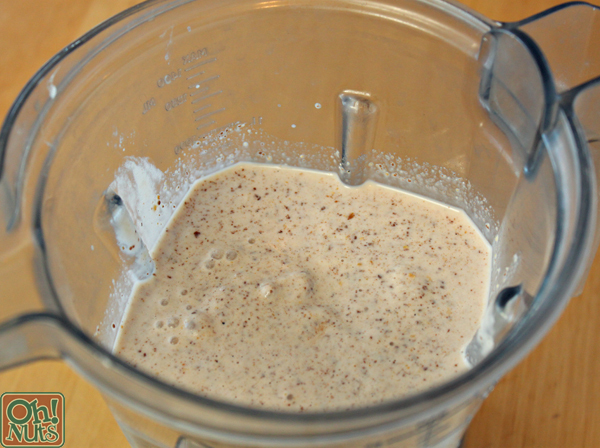 Blend in 5-second bursts, scraping the bottom and sides of the mixer occasionally to help everything mix evenly. 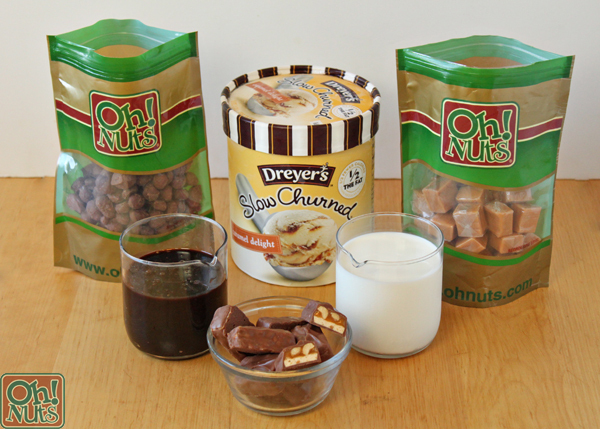 The milkshake is done when it has a thick, smooth texture and small bits of candy bars and peanuts scattered throughout. 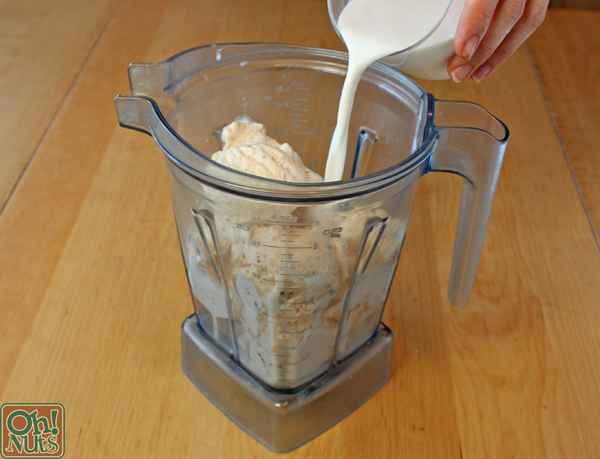 The texture should be similar to a cookies and cream milkshake–not super chunky, but not perfectly smooth. Drizzle some hot fudge sauce in the bottom of the glass, then add a drizzle of caramel sauce and a pinch of chopped candy bars. Pour the milkshake into the glasses, and garnish with whipped cream, more chopped candy, sprinkles, or anything else you’d like! Enjoy immediately.